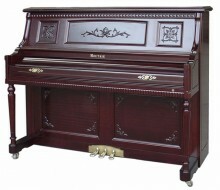 Comes with a free adjustable piano bench and piano cover. 1. Special hammer:special inner wool hammer. 2. The treble is clear and bright with continuous and soft resound, and meanwhile the bass is deep and sedate with natural and unitary transition of music zone. Both the practice and performance are smooth and vivid. 3. Natural on the keyboard: artificial ivory. Sharp on the keyboard: Synthetic material. 4. Push top, children could use. 5. Equipped with advanced piano chair and slipcover . 6. Soundboard uses absolute wood or multiplex wood. 7. The bridge is made of high-quality maple wood, which is imported from Europe or Dongbei. It has good conduction of vibration, and makes the sound source steady. 8. The string imported from Germany “ROSLAU”. 9. Equipped with agraffe, insure the sound persistent. 10. Pin block: advanced se-wood lamination craft , the technic insure the sound persistent. 11. 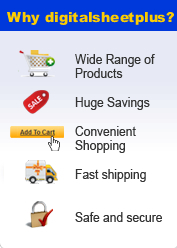 With silver hardware, brilliance and non-discoloration can be permanently guaranteed. In Stock. Processing Time: 45 Days. 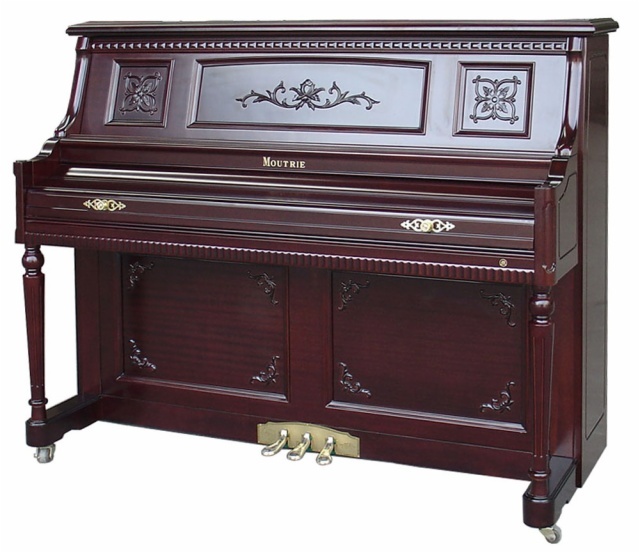 Click the button below to add the Upright Piano F12-124 to your wish list.